With that foot in the air, I think it is fair to say that George is doing what he (Rey, really) thinks is some kind of Indian dance. Regular readers of AICL know that I find this sort of play problematic because it immediately lapses into stereotyping. As noted above, the book was first published in 1963. But, it has been published again and again... most recently (I think), in 2013, with a set of flashcards. That year (2013) was the 50th anniversary of the book, hence, a special 50th Anniversary edition. The local library doesn't have it. I wonder if the 't' page was revised? Do you have that version on your shelf? If yes, I hope you'll take a look and let me know. 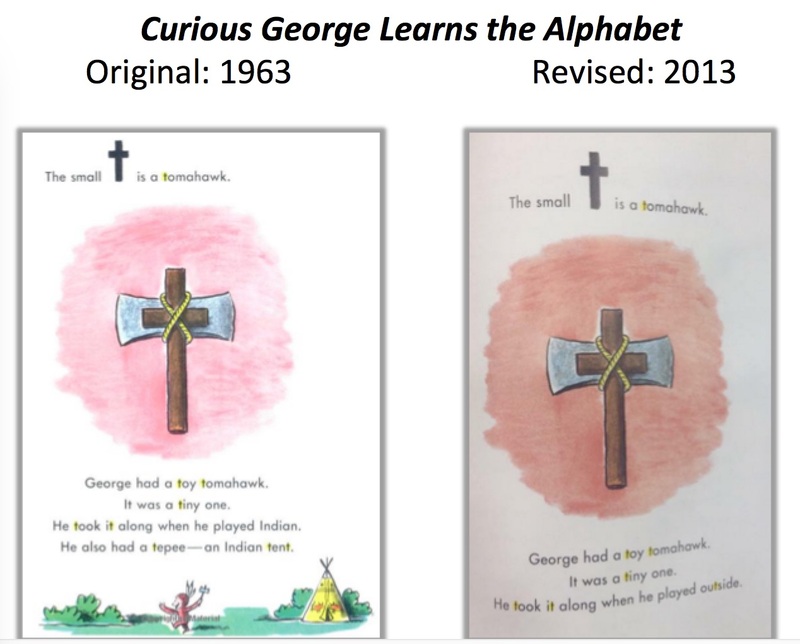 In 1963, George was using that tomahawk and his tepee to play Indian. In 2013, we don't know how he is using it. He takes it with him outside. Readers are invited to fill in the gap as they imagine what George does with that tomahawk once he gets outside. I'm glad the revisions were done. I would love to have access to the conversations that took place about the page and how it ought to be changed, and I'd love to know how children fill in that gap. The child attended/attends a summer camp or event that invites kids to play at being Indian. The child attended/attends a birthday parties where playing Indian is the theme. The child goes to sports events where the mascot is meant to be an Indian. The child chooses an Indian costume for Halloween. What would your child, or the children in your library, imagine? 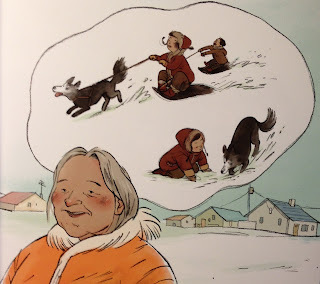 Two years ago I read--and recommended--Kamik: An Inuit Puppy Story, a delightful story about a puppy named Kamik and his owner, a young Inuit boy named Jake. In it, Jake is trying to train Kamik, but--Kamik is a pup--and Jake is frustrated with the pup's antics. 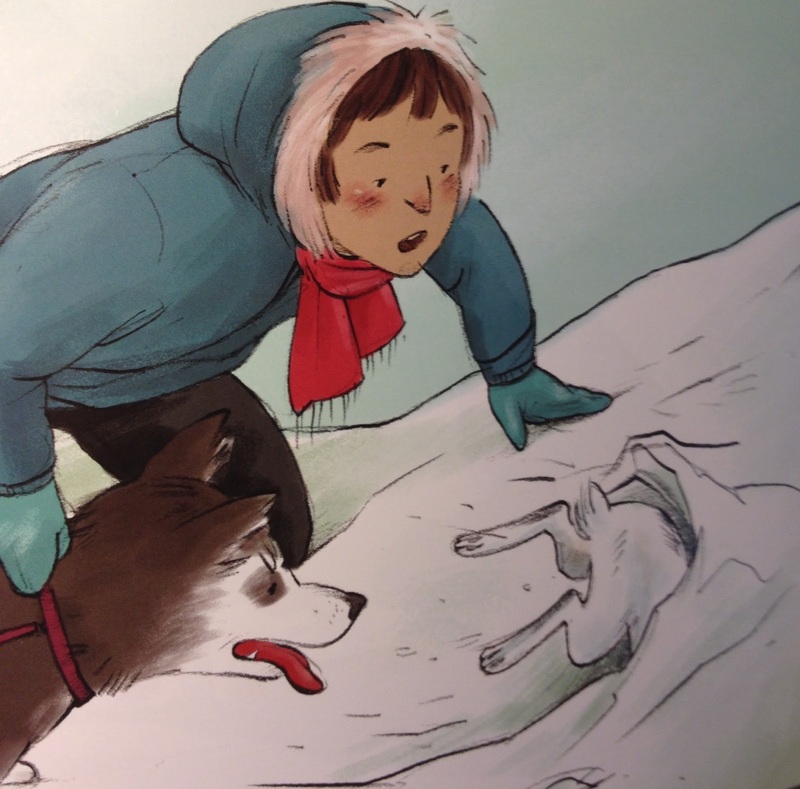 Jake's grandfather is in the story, too, and tells him about sled dogs, imparting Inuit knowledge as he does. Today, I'm happy to recommend another story about Kamik and Jake. The author of Kamik: An Inuit Puppy Story is Donald Uluadluak. This time around, the writer is Matilda Sulurayok. Like Uluadluak, Sulurayok is an Inuit elder. In her storytelling of those memories, Anaanatsiaq is teaching Jake. Then she fastens a small bundle on Kamik and suggests Jake take Kamik out, away from the other dogs, for a picnic. They set off walking. After awhile, Jake opens the picnic bundle. Inside, he finds things to eat, but he also finds a sealskin and a harness. Playtime training, then, is off and running! Things get tense, though, when Kamik takes off after a rabbit in the midst of a darkening sky, and Jake realizes he hasn't taught him the command to stop. The rabbit, as you can see, gets away. Jake is scared, but in the end, Kamik gets him home, where he learns a bit more about sled dogs and their sense of smell. Through Kamik, Jake, and his grandparents, kids learn about Inuit life, and they learn some Inuit words, too. A strength of both these books is the engaging, yet matter-of-fact, manner in which elders pass knowledge down to kids. Nothing exotic, and nothing romanticized, either. 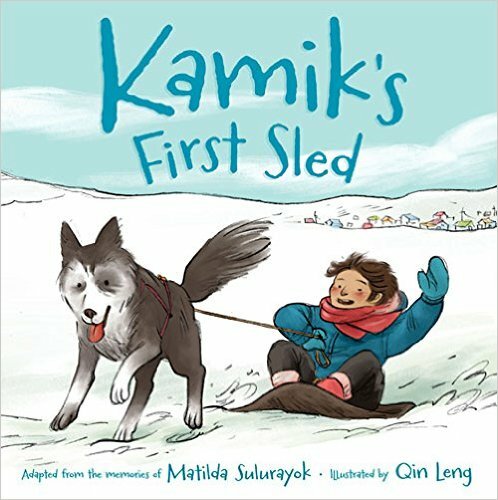 I highly recommend Kamik's First Sled, published in 2015 by Inhabit Media.